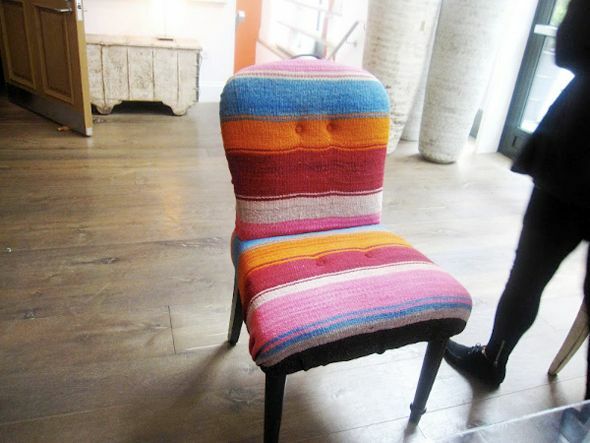 Ever since this project that I did for Domino, I've been obsessed with upholstering furniture with flat woven rugs. It's surprisingly easy to work with the thicker material (especially if you have this amazing staple gun) and it just looks so unique. Not to mention it is super hard-wearing and stain-resistant! 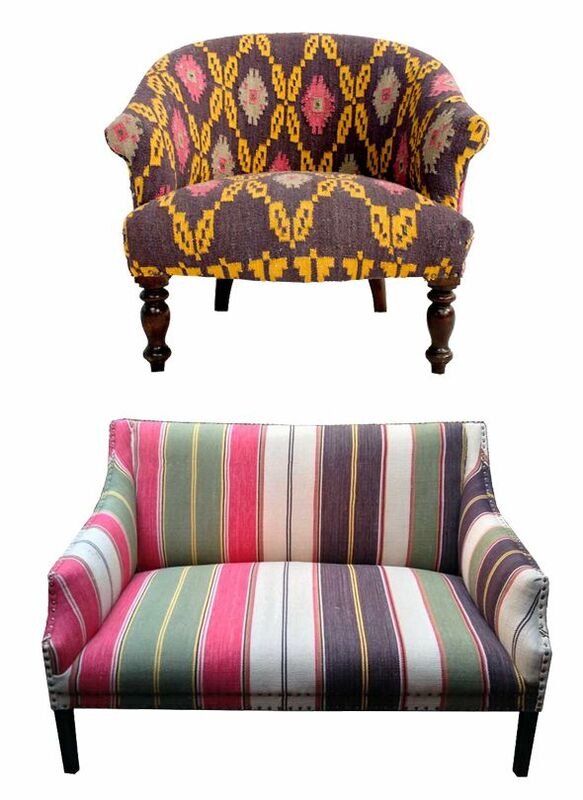 I'm in the middle of two different rug upholstery projects that I'm excited to share with you soon. 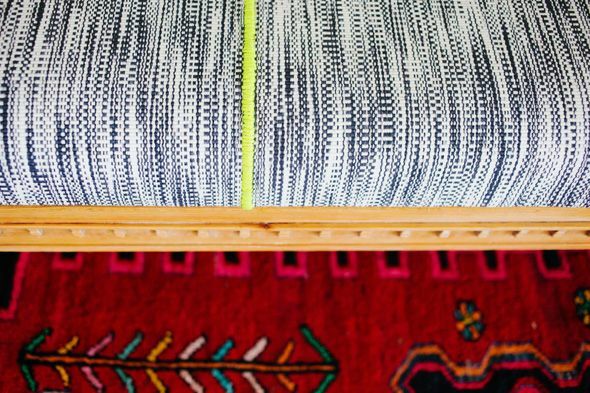 I'm hoping to start a third rug upholstery project right away too, since hunching over is getting more and more tricky these days! 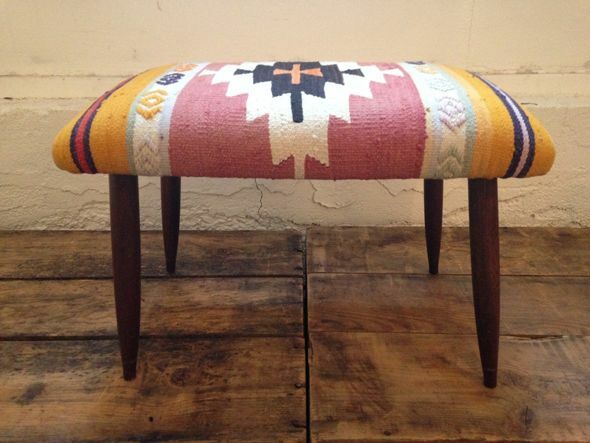 I just need to find a good (and cheap) kilim to use. 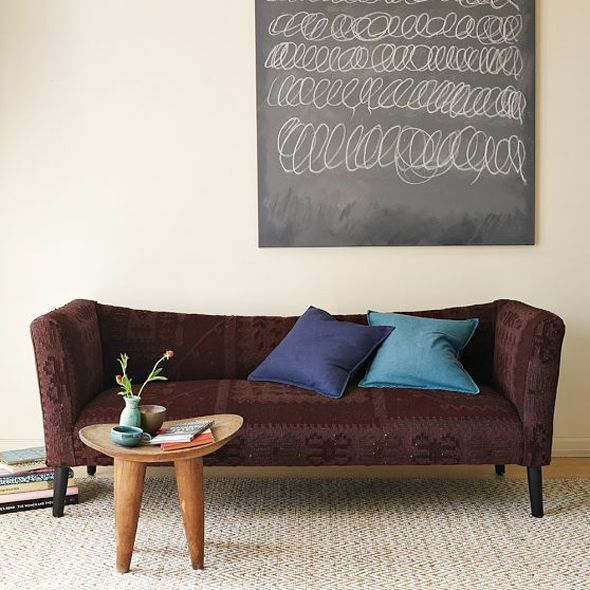 I found this curvy headboard for almost nothing at a junk store here locally and I think it would look so great in a pastel, washed out stripey kilim for one of the girls rooms. I'm thinking white linen for the welting. 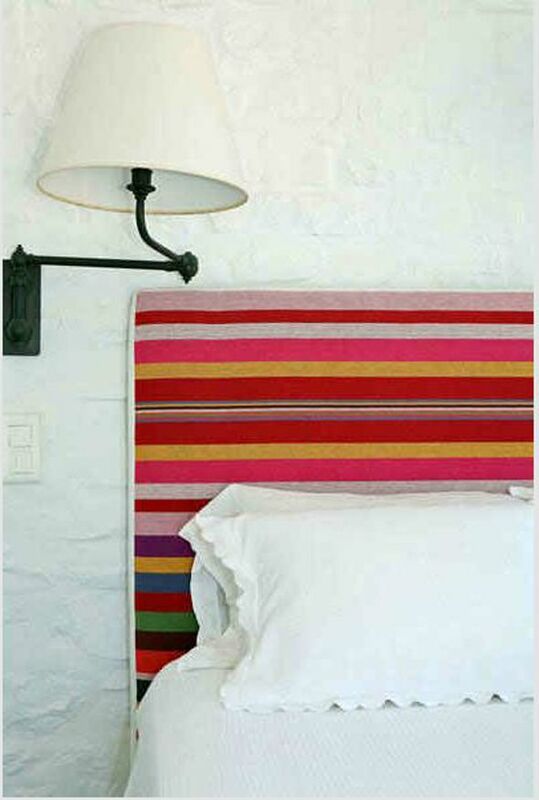 It's not quite the same as mine - but I like the concept of a really interesting ethic textile on the upholstery paired with pretty, simple bedding. 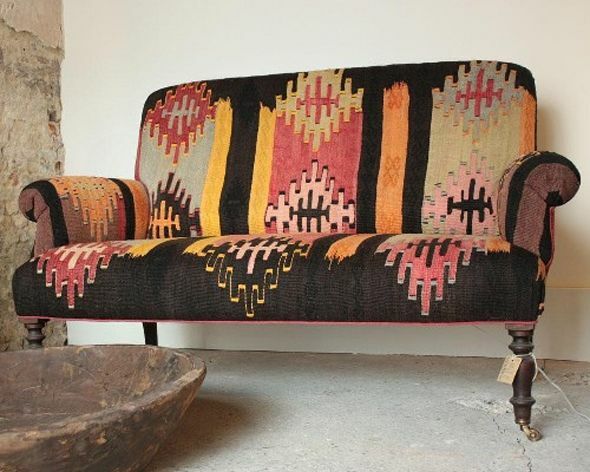 I've got some ideas up my sleeve, but in the meantime, here are some of my favorite inspiration images for kilim-upholstered furniture pieces. that's the nicest "junk store" stuff I've ever seen! 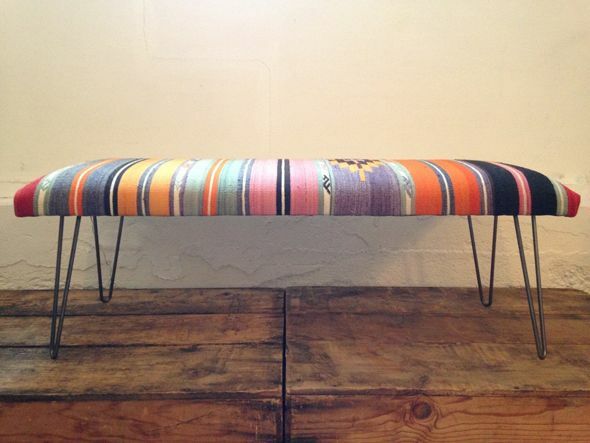 Stretching a striped fabric over a curvy edge is gonna be tough. I'm anxiously waiting to see how you do this. But if anyone can, you can! I wish we had stores like this! Can't wait to see how it turns out Jenny! Happy Thanksgiving to you and your's! Oooh love the idea - can't wait to see how it turns out! Wait - your upholsterer gives you a deal when you strip off the old fabric?! I have a chair that I stripped all the fabric off of intending to reupholster but then just lost motivation and it's been sitting in my bedroom bare for a long time (like more than 1 year sadly). I called around and a couple of upholsterers actually said they would charge me more because I had already taken off the fabric, even when I told them I had all the old pieces labeled and could pin them to the frame so they knew exactly how it was put together. Anyway, I'm local and I now you probably don't want to reveal your upholsterer's info, but is this routine practice for upholsterers to charge more or should I keep calling around? Love your blog by the way - it is my favorite by far! You never ever disappoint! That headboard is amazing. Hi Jenny! 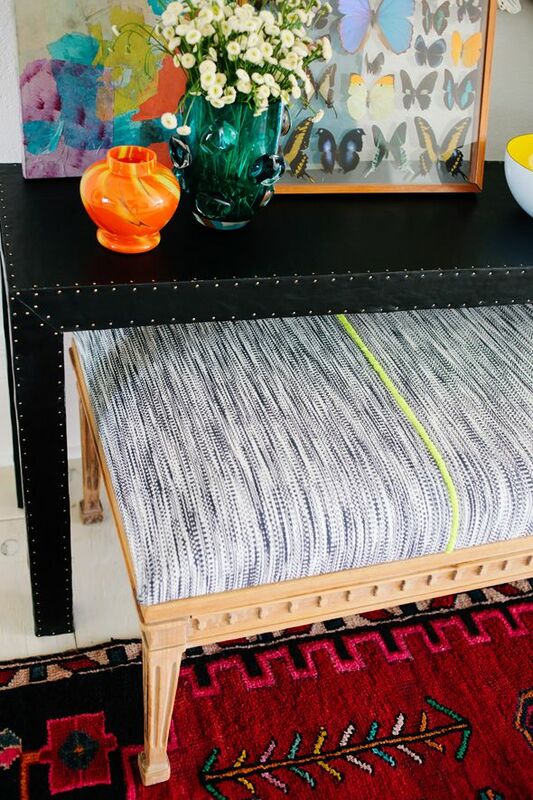 I used a Homegoods rug to upholster a bench in my boys' bedroom. I love it's texture and durability! If interested you can check it out here, http://providenthomedesign.com/2014/08/01/boys-shared-bedroom-reveal/. 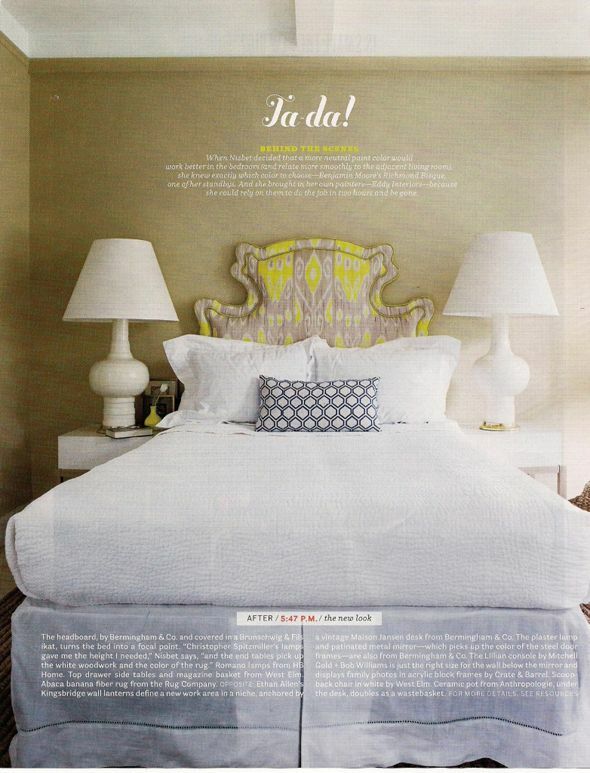 Can't wait to see how your headboard turns out! Such a great find! 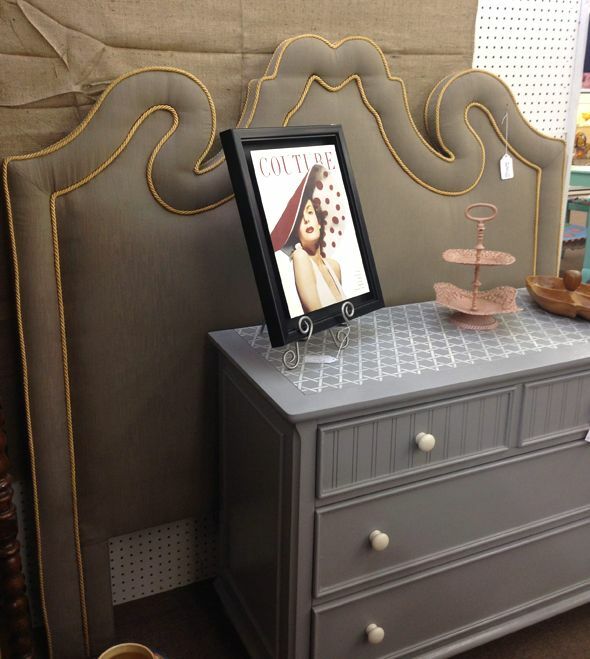 What store in AZ did you find that headboard? ? 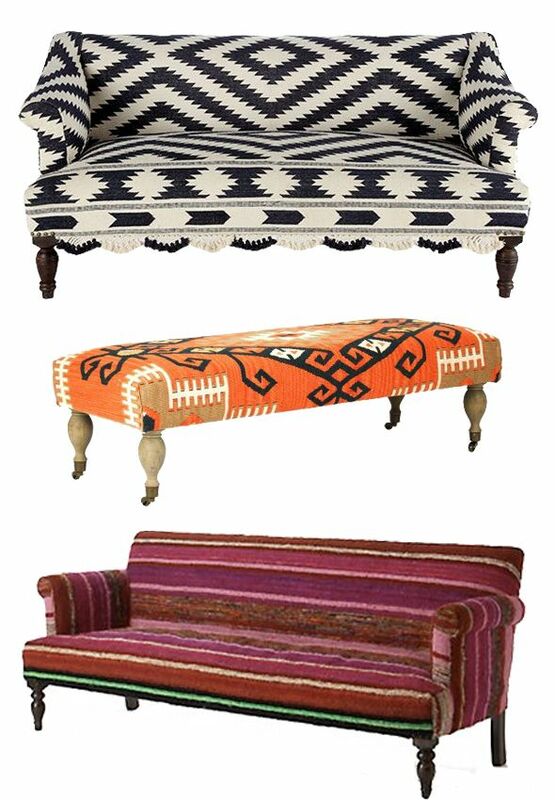 We recently bought a kilim bench (from Overstock) for the dining room, and it's just so surprisingly good. The rug material is sturdy as anything, and it just has the look of something that has been in the house for years and will make sense forever. Such a happy buy. Love all the inspiration pics here, too! 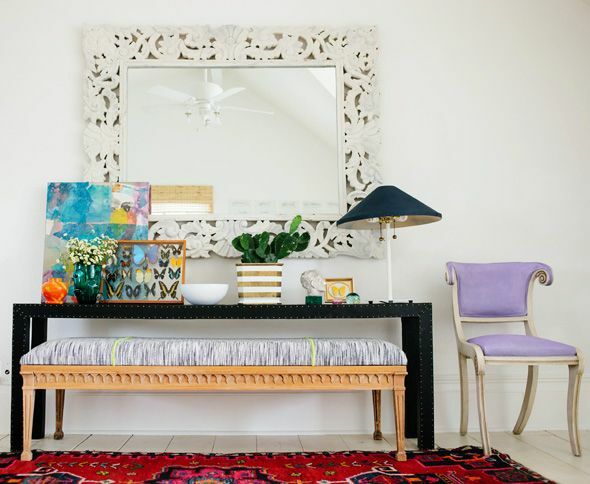 Love the contests you post and love this shttp://www.interiordefine.com/shop/kennedyofa!